Please note that this is not an official website of the publication. The age of the “Russian Life” includes entire layers of history: the creation of the USSR; the inter-war period; Leninist and Stalinist terror in the USSR; the persecution of religion; World War II; the Cold War and the conflicts in Korea and Vietnam; the Communist takeover of China; space travel; the evolution of computers; perestroika and the disintegration of the USSR; the genesis of post-Soviet Russia; the terror of September 11, 2001 and the struggle with global terrorism. It is necessary to explain the business side of the publication of Russian Life. The publication of a newspaper of this profile cannot be subject to simple commercial priorities. The main principles of the publication are informational satisfaction for the readers, full publishing and editorial independence, objectivity, a careful fulfillment of the mission of chronicler of the community. The regular revenue of the publication consists of subscription fees and modest income for advertising. Subscribers of Russian Life live in California and many other states of the USA, in Canada, Australia, Brazil and other countries. The expenses of the newspaper have been reduced to a minimum. The editors work for free, the technical staff receives such small pay, that their efforts to produce the newspaper every week are in effect also a charitable contribution to the common goal. Therefore, the newspaper is published now for decades with a substantial annual deficit. How is this significant operational deficit covered? From time to time, the newspaper receives gifts from readers, who consider the existence of Russian Life sufficiently important for our now world-wide community. For example, we remember with gratitude the generosity of the late A.M. Poniatoff (†1980), founder of Ampex Corporation in the Silicon Valley, who bequeathed a significant sum to the newspaper. Such gifts feed a dwindling reserve, from which the operational deficit of the newspaper is covered. But this reserve is not infinite, and today one can calculate mathematically the date, when it will be necessary to “turn off the lights in the editorial office,” unless generous support is received from those, who are not indifferent to the fate of the newspaper. We sincerely hope that the 90th year of publication will not be the last for Russian Life. To continue publishing, the newspaper needs material help from friends and readers. How should such help be manifested? In the first place, all who read the newspaper should become regular subscribers. The price is moderate and different periods are available. Subscription revenue covers approximately one-half of each issue’s production and delivery expenses. This means, each second issue of the newspaper is in fact a gift to the subscribers. Secondly, all friends of the newspaper are asked to make monetary gifts to the newspaper, so the financial reserves of the publication increase, instead of decreasing. No only the survival of the newspaper but also its independence and objectivity depend on community support. 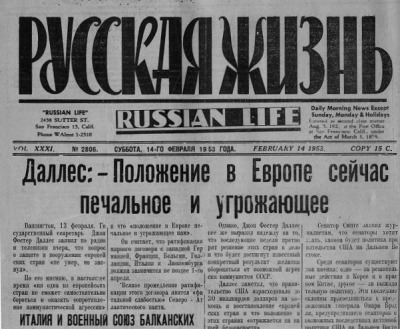 The newspaper cannot solicit grants from anyone and at the same time claim full independence – and we believe that the independence of Russian Life is a key attribute of its community significance.